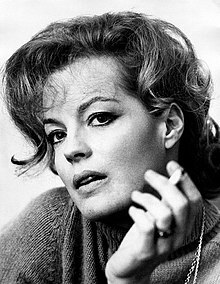 Romy Schneider (23 September 1938 – 29 May 1982) was a film actress born in Vienna and raised in Germany who held German and French citizenship. She started her career in the German Heimatfilm genre in the early 1950s when she was 15. From 1955 to 1957, she played the central character of Empress Elisabeth of Austria in the Austrian Sissi trilogy, and later reprised the role in a more mature version in Visconti's Ludwig. Schneider moved to France, where she made successful and critically acclaimed films with some of the most notable film directors of that era. Schneider was born Rosemarie Magdalena Albach in Vienna into a family of actors that included her paternal grandmother Rosa Albach-Retty, her Austrian father Wolf Albach-Retty, and her German mother, Magda Schneider. Four weeks after Schneider's birth, the parents brought her to Schönau am Königssee in Germany, where she and later her brother Wolf-Dieter (* 1941) grew up with their grandparents Franz Xaver and Maria Schneider on the estate named Mariengrund. In her first year Romy Schneider was given into the hands of a governess. The parents were very rarely present due to their acting engagements. In 1943 they separated and were divorced in 1945. Schneider was enrolled in the elementary school of Schönau in September 1944 and attended from July 1949 the girls residential school at Castle Goldenstein, a private secondary school of the Augustinian choir women B.M.V. in Elsbethen near Salzburg. Already during her schooldays, she discovered her passion for acting, which is why she was often on stage at theatrical performances at the residential school. In her diary entry of June 10, 1952, she wrote: "If it were up to me, I would immediately become an actress. [...] Every time I see a nice movie, my first thoughts are about the idea: I definitely have to become an actress. Yes! I have to! " On July 12, 1953, she left the residential school Goldenstein with the degree of secondary school level 1. After the summer holidays, she was supposed to start studying at the college of art in Cologne, as she had shown a talent for painting and drawing during art classes at the school. In addition, Magda Schneider was meanwhile in Cologne with the restaurateur and entrepreneur Hans Herbert Blatzheim. The training, however, she did not compete in favor of her first film role. After her parents' divorce in 1945, Magda took charge of Romy and her brother Wolf-Dieter, eventually supervising the young girl's career, often appearing alongside her daughter. Her career was also overseen by her stepfather, Hans Herbert Blatzheim [de], a restaurateur who, Schneider indicated, had an unhealthy interest in her. Romy Schneider's first film, made when she was 15, was When the White Lilacs Bloom Again in 1953, credited as Romy Schneider-Albach. In 1954, Schneider, for the first time, portrayed a royal, playing a young Queen Victoria in the Austrian film Mädchenjahre einer Königin (known in the U.S. as The Story of Vickie, and in Britain as Victoria in Dover). Schneider's breakthrough came with her portrayal of Empress Elisabeth of Austria, in the romantic biopic Sissi (1955) and its two sequels, Sissi – The Young Empress (1956), and Sissi – Fateful Years of an Empress (1957), all with Karlheinz Böhm, who became a close friend. Less stereotypical films during this busy period include The Girl and the Legend (1957), working with a young Horst Buchholz, and Monpti (1957), directed by Helmut Käutner, again with Buchholz. Schneider soon starred in Christine (1958), a remake of Max Ophüls's 1933 film Liebelei (in which her mother Magda Schneider had played the same role). It was during the filming of Christine that Schneider fell in love with French actor Alain Delon, who co-starred in the movie. She left Germany to join him in Paris, and they announced their engagement in 1959. Schneider decided to live and to work in France, slowly gaining the interest of film directors such as Orson Welles for The Trial (1962), based upon Franz Kafka's The Trial. She was also introduced by Delon to Luchino Visconti. Under Visconti's direction, she gave performances in the Théâtre Moderne as Annabella (and Delon as Giovanni) in John Ford's stage play 'Tis Pity She's a Whore (1961), and in the film Boccaccio '70 (segment: "The Job"). In 1962, Schneider played Anna in Sacha Pitoëff's production of Chekhov's play The Seagull, also at the Théâtre Moderne. A brief stint in Hollywood included a starring role in Good Neighbor Sam (1964), a comedy with Jack Lemmon, while What's New Pussycat? (1965), although American-financed, was shot in and around Paris. Schneider co-starred with Peter O'Toole, Peter Sellers, and Woody Allen. Schneider and Delon decided to separate in 1963, although they remained close life-long friends. They continued to work together in such films as La Piscine (The Swimming Pool, 1968), which revitalized her career, and The Assassination of Trotsky (1972). Schneider continued to work in France during the 1970s, most notably with director Claude Sautet on five films. Their first collaboration, The Things of Life (Les choses de la vie, 1970) with Michel Piccoli, was a great success, and made Schneider an icon in France. The three worked together again for the noir thriller Max et les ferrailleurs (Max and the Junkmen, 1971), and she appeared with Yves Montand in Sautet's César et Rosalie (1972). Schneider portrayed a more mature and realistic Elisabeth of Austria in Ludwig (1972), Visconti's film about the life of King Ludwig II of Bavaria. "Sissi sticks to me just like oatmeal", Schneider once said. Other successes from this period included Le Train (1973), where she played a German-Jewish refugee in World War II, Claude Chabrol's thriller Innocents with Dirty Hands (Les innocents aux mains sales, 1975) with Rod Steiger, and Le vieux fusil (1975). The gritty That Most Important Thing: Love (L'important c'est d'aimer, 1974) garnered her first César Award (France's equivalent of the Oscar), a feat she repeated five years later, in her last collaboration with Sautet, for A Simple Story (Une histoire simple, 1978). She also acted in Le Trio infernal (1974) with Michel Piccoli, and in Garde à vue (1981) with Michel Serrault and Lino Ventura. An unpleasant incident occurred during this period with leading German film director Rainer Werner Fassbinder, who wanted her to play the lead in his film The Marriage of Maria Braun (1979). Negotiations broke down when he called Schneider a "dumb cow", to which she responded by declaring she would never work with such a "beast". Fassbinder cast Hanna Schygulla instead, reviving his professional association with an actress to whom he had also been offensive. Schneider starred in Bertrand Tavernier's Death Watch (La mort en direct, 1980), playing a dying woman whose last days are watched on national television via a camera implanted in the brain of a journalist (Harvey Keitel). It is based on David G. Compton's novel. Schneider's last film was La Passante du Sans-Souci (The Passerby, 1982). Following the end of her relationship with Delon, Schneider married German director and actor Harry Meyen in July 1966. The couple had a son, David Christopher (1966–1981), but later divorced. In 1975, Schneider married Daniel Biasini, her private secretary; they separated in 1981. Their daughter, Sarah Magdalena, is now an actress. Schneider's son David died at the age of 14 after attempting to climb the spiked fence at his stepfather's parents' home and puncturing his femoral artery in the process. Schneider began drinking alcohol excessively after his death. However, Claude Pétin—a friend of hers—said that she no longer drank at the time of her own death. Schneider was found dead in her Paris apartment on 29 May 1982. The examining magistrate Laurent Davenas [fr] declared that she died from cardiac arrest. Pétin said that Schneider's cardiac arrest was due to a weakened heart caused by a kidney operation she had had months before. Her tombstone at Boissy-sans-Avoir, Yvelines, bears her birth name, Rosemarie Albach. Funeral guests were Gérard Depardieu, Jean-Claude Brialy, Michel Piccoli, Claude Sautet, former husband Daniel Biasini, and Laurent Pétin. Shortly afterwards, Delon arranged for David to be buried in the same grave. The French journalist Eugène Moineau initiated in 1984 the Prix Romy Schneider. It is one of the most prestigious awards for upcoming actresses in the French film industry, and is given by a jury each year in Paris in conjunction with the Prix Patrick Dewaere (formerly the Prix Jean Gabin). In 1990, the Austrian newspaper Kurier created the Romy TV Award in honour of Schneider. In 2003, she was voted 78th on the list of the greatest Germans in the German TV program Unsere Besten (the German version of 100 Greatest Britons)—the second-highest ranked actress (Marlene Dietrich was 50th) on that list. Until 2002, the Austrian Federal Railways InterCity service IC 535 from Wien Südbahnhof to Graz was named "Romy Schneider". A movie about Schneider's life, titled Eine Frau wie Romy/Une femme comme Romy (A Woman Like Romy), was planned by Warner Bros. for 2009; Schneider's role was going to be played by Yvonne Catterfeld. The project was cancelled in July 2009. A musical about Schneider, Romy – Die Welt aus Gold (Romy – The Golden World) was premiered in 2009 at the Theater Heilbronn. In November 2009, the ARD broadcast the feature film Romy [de] with Jessica Schwarz in the title role. The film 3 Days in Quiberon (2018) by Emily Atef describes a 1981 episode in Schneider's life in the French town of Quiberon. ^ L'Enfer remained unfinished in 1964; much footage from the film was included in the documentary L' Enfer de Henri-Georges Clouzot (2009) by Serge Bromberg [fr]. Tast, Hans-Jürgen (2008). Romy Schneider: ein Leben auf Titelseiten; [anlässlich des 70. Geburtstags der Schauspielerin Romy Schneider] [Romy Schneider: a life on front pages; [on the occasion of the 70th birthday of actress Romy Schneider]]. Kulleraugen (in German). 36. Schellerten: Kulleraugen-Medienschriften. p. 33. ISBN 978-3-88842-036-8. Töteberg, Michael (2009). Romy Schneider (in German). Rowohlt Verlag. ISBN 978-3-499-50669-7. ^ "Biography" (in French). pipole.net. Archived from the original on 30 October 2007. Retrieved 28 October 2007. Romy témoignant par la suite de l'intérêt malsain qu'il lui portait. ^ Gretter, Susanne. "Biography" (in German and French). FemBio Frauen-Biographieforschung e.V. Retrieved 28 October 2007. Il a clairement proposé de coucher avec moi. ^ Leinkauf, Thomas (19 September 1998). "Der Liebling der Machos". Berliner Zeitung (in German). Archived from the original on 19 January 2008. Retrieved 28 October 2007. Blatzheim in ihrer Jugend mit ihr schlafen wollte. ^ Nick Rees-Roberts; Darren Waldron, eds. (2015). Alain Delon: Style, Stardom and Masculinity. Bloomsbury USA. p. 52. ISBN 9781623564452. ^ "Und retten kann uns nur Heinz Schenk". Stern (in German). 9 August 2007. Retrieved 26 March 2011. ^ Beier, Lars-Olav (23 May 2007). "Die Berührbare". Der Spiegel (in German). Retrieved 14 February 2008. ^ Derek Malcolm "Rainer Werner Fassbinder: The Marriage of Maria Braun", The Guardian, 28 January 1999; retrieved 2 March 2009. ^ a b "Romy Schneider ne s'est pas suicidée". Paris Match (in French). Paris. Retrieved 2 June 2012. ^ Delon, Alain (11 June 1982). "Adieu ma puppelé". Paris Match (in French) (#1724). Archived from the original on 16 June 2010. Retrieved 24 September 2009. ^ Sander, Daniel (12 February 2008). "Ein Soap-Sternchen gibt den Weltstar". Der Spiegel (in German). Retrieved 14 February 2008. ^ "Ich hatte eine Gänsehaut". Süddeutsche Zeitung. 12 February 2008. Retrieved 26 March 2011. Wikimedia Commons has media related to Romy Schneider.